For the last 20 years, Rafael Gómez Pérez has been performing elegant and astonishing acts of magic. 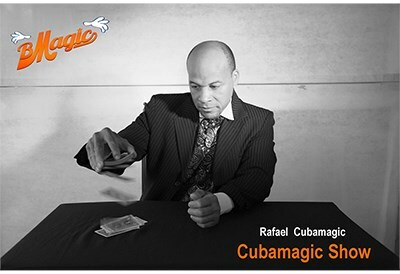 Vanishing Inc are pleased to be able to offer you this video download of some of Rafael's powerful close-up, stage and parlour magic pieces with cards, coins and much more. A great close up routine with a transposition of 5 coins on the table. A multiplying effect of jumbo coins. One spectator shuffles a blue deck and another spectator shuffles a red deck. Then they freely chose the same card out of their decks. A surprising way to localise a card in the middle of the deck after it has been shuffled and cut. A beautiful routine of manipulation of the four aces. A prediction of a selected card is revealed in an impressive way. A surprising way to identify a selected card with a clock. An original idea to any card at any number. A great version of the classic water and wine. A beautiful routine with a deck and four glasses. A selected card vanishes from the deck and appears when the magician throws the deck above the table. Note: This video is in Spanish and there are no subtitles. Running time is 75 minutes.